Every year I visit Chile. And I always try to visit the Plaza de la Constitución, a large public opening to the north of the Chilean government’s presidential palace, La Moneda, to take in the majesty and historical vibes of this special place. There is a statue of deposed President Salvador Allende in the southeast corner of this plaza. If I stand in Allende’s shadow I can gaze from this strategic vantage point directly across the square at what was the old classic Hotel Carrera. Now the Ministry of Foreign Affairs, it’s where I went a half century ago as a recent arrival to Santiago to get a glimpse of visiting Queen Elizabeth. A young man in my early 20s, I admit I was entranced by her porcelain-like regality. But as I stand here, that distant memory is soon rudely broken by another, the image of Mirage jets of the Chilean air force screaming in from the north, just missing the tops of the buildings along Agustinas Street, strafing with brutal accuracy the Moneda, modest emblem of Chilean Democracy, destroying a legitimate political process gone wrong. I was not there at the time, but having seen many films and pictures of that fatal 11th of September 1973, when General Augusto Pinochet “took his country back” from overreaching leftist revolutionaries, I picture the helmeted defenders of the Unidad Popular government leaning out of the windows of the government office buildings along Morandé street, including the Ministry of Justice, with rifles and pistols ablaze in a futile attempt to defend their revolution that just that morning had turned fatally violent. If I stand in this spot long enough, I can see images of the black smoke beginning to rise from the innards of the Moneda Palace. And, with a little more imagination I might hear Salvador Allende’s rock hard image next to me sigh the words that are now engraved on this stature: “Tengo fe in Chile y su destino.” His faith in Chile and its destiny was surely tested that day; my image of that day in 1973 ends as his staff, colleagues, and defenders stream out the doors into the side streets, some of whom will disappear into the side streets, the safety of homes of friends, and eventually into exile in friendly countries, while others are captured or give themselves up to the army troopers closing in, tightening the noose on their government and the country’s democracy, their fate, and that of their leader, ultimately very sad. Sure, I can rerun the events of 1973 by simply showing up in this Plaza de la Constitución, and I often do, for this was a most game-changing day for Chileans and their political and social systems. It is important, I believe, to remember tragic events like Chile’s September 11. Of course there is some comfort in forgetting, forgiving, and moving on. But the lessons learned from epic events, even if it creates some bitterness and anguish, must be remembered and studied so that similarly bad, fatal decisions can be avoided in the future. Maybe the lesson from Chile’s tragic event that day that played out in the very Plaza de la Constitución where I was standing, is that “taking your country back” can be incredibly costly, with unintended consequences forcing a great burden on the citizens and their institutions for decades thereafter. But on this day, in late November of 2016, I was in the center of Santiago on a much simpler mission. I had to renew my Chilean identity card which confirms my permanent resident status in Chile. The whole process for which I had budgeted a full day, only took me about half an hour. As a beneficiary of the Chileans’ great respect for their elders, I was escorted to the special expedited waiting line for applicants in the “tercera edad” (loosely translated becomes “those in their third quarter”, although I often feel it is the fourth!). So I had lots of time to hang around this area of central Santiago. 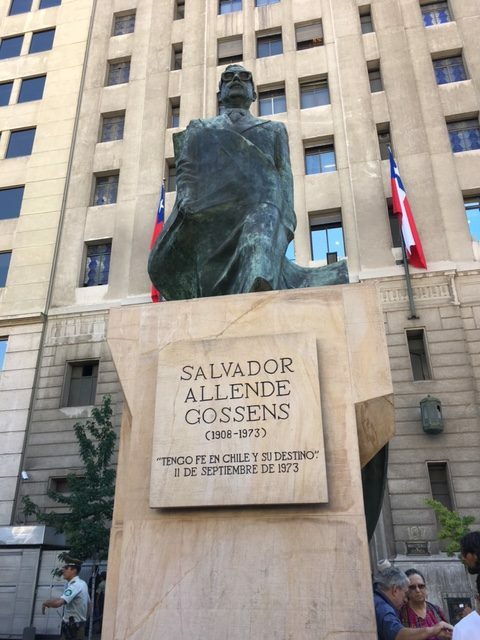 Whoever chose the location for the Allende statue must have picked this spot so he can watch over the comings and goings of the restored Moneda Palace, where he was the day he died. 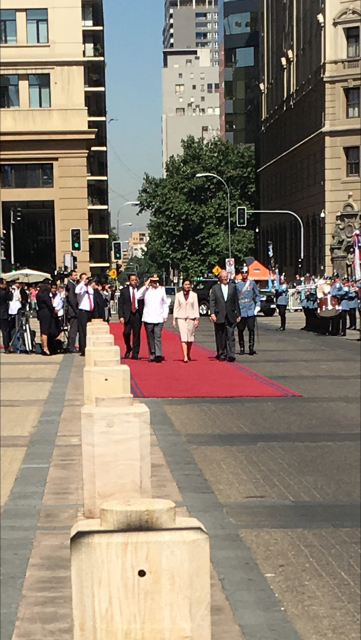 As I stood there next to him I noticed there was a red carpet stretched out across the opened entrance gate of the Moneda Palace. A military band in full regalia, lined up nearby, signaling what surely was to be ceremonies for an important visitor. 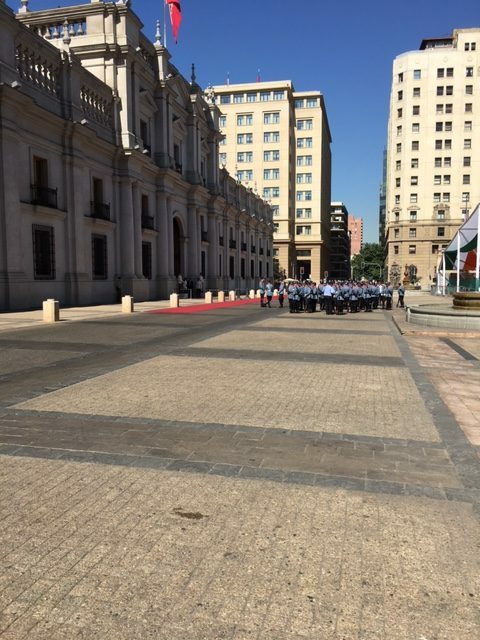 Sure enough, the President of neighboring Peru, Pedro Pablo Kuzcynski, was in town and that morning he was due to arrive, receive full honors, review the military guard, and then enter the Moneda Palace to sign a myriad of agreements as proof of the slowly improving political and commercial relations between Chile and Peru. The leaders of both countries have good reason to be proud of the neighborly relationship which has being promoted and, including Colombia and Mexico, formalized in the Alianza del Pacifico. This Alliance of four Pacific countries promises significant benefits from freer trade arrangements between the four countries. It’s a sub-group of countries involved for the last couple of years in the larger negotiation of the Trans-Pacific Partnership (TPP), totally dissed by presidential candidate Donald Trump. During his visit to Chile, President Kuzcynski was loud and clear in insisting that countries in the southern hemisphere that are committed to free trade, like Chile and Peru, that have followed the lead of their northern trading partners, especially the US and Europe, and opened their markets and their borders, are now terribly concerned. “The dark cloud of protectionism that had been hiding out has re-surged in the North in the form of the Brexit vote and the xenophobic Trump election”. 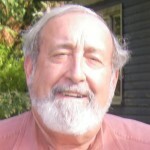 In that context, and assuming the Trans-Pacific Partnership trading agreement has been rendered dead from one swift blow of the Candidate’s sharp tongue, this was an important State visit for both Chile and Peru, and the Pacific Alliance is now an even more important multinational trade agreement. However, having stood awhile on this small corner of the Plaza de la Constitución in Santiago, Chile, inspired by the place and the moment to ponder really big issues of governance, global development, and international relations, I noted that it was 2 PM; that’s lunch time in Chile. So I went off into the din of bustling downtown Santiago in search of an empanada and maybe a glass of vino tinto, tightly clutching my mundane accomplishment of the day: the receipt for my renewed Chilean identity card, to be picked up in 3 weeks time, ensuring many more visits to this memorable corner of the world. Now that, folks, is success, and I’ll take it! Posted in Santiago, Chile, on December 3, 2016. Interesting. Nice coincidence that the President of Peru paraded by, and that trade was on his mind. Thank you, Dave for sharing some special moments in your memory bank. I, too, was there in 1973, in June to witness the failed “tankaso” and in early October to visit with Luisa’s family. Your description of the September events transported me back to a time of uncertainty for Chile and deep anxiety for the safety of family. As events unfolded and we observed and listened from our safe heaven in southern Brazil ( I was teaching at the university of Santa Maria), I hoped and prayed for the safety of the family and a better tomorrow for Chile. 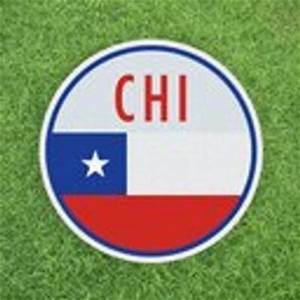 The family was kept safe and Chile has since grown into an economic powerhouse in South America, bu I’m not sure, if we now have a better Chile. 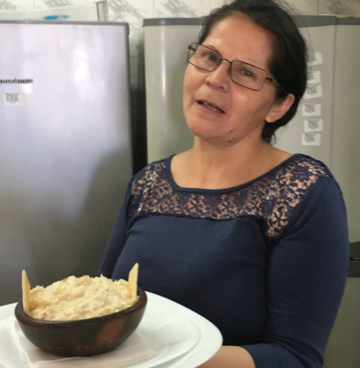 Maybe a “better Chile” is found in the minds of the Chilean people and not mine. Hope all is well. Warm wishes. Muchas gracias David.. . Otra mas de tus claras notas llenas de certeras observaciones. En ellas haces sentir también el gran cariño que tienes por Chile ahora y desde tus años como voluntario del Cuerpo de Paz y el Instituto Forestal donde nos conocimos. Espero que logremos encontrarnos durante tu permanencia por estos lados. Dave, Thanks for sharing such a moving experience, and we also happened to be in the Hotel Carrera buying a Miami newspaper when the Queen strolled by us right in the lobby. Also got a kick out of the tercera edad line and you’ll be glad to know the Houston Metro has signs posted directing “los ancianos” to special seating areas. So many poignant memories of you and our group in Chile. And if I recall correctly, the Queen was headed to a special Classico horse race at the Club Hipico; so were we. She went by limo, we by crowded bus.